Working Frequency 5 Hz up to 120 kHz Digital Phase Shifter 0 ... +360_Current and Voltage Input Parameter Control by local Switchesand opto-isolated digital Inputs Mounting Kit MK-LIA-2 and Reference Osclator Modules SOM-1 available Lock-In-Amplifier as a Standard The high prices for usual lock-in-amplifiers mean that they are not as common in noise limited experiments as would be desirable. For this reason we have designed a complete, easy-to-use and moderate cost board, expanding the reach of lock-in-amplifiers into cost-sensitive applications. 19"-Board versus PC-Board 19"-boards can operate in EMI-designed standard cases and are not exposed to the electromagnetic extremely disturbed environment in a computer case. 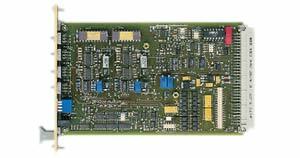 In addition, they are the perfect choice for designing high-performance multi-channel systems.